Pipavav Defence & Offshore Engineering Co Ltd.
Pipavav Defence & Offshore Engineering Company Ltd (BSE: 533107, NSE: PIPAVAVDOC) counter in NSE, on Friday, witnessed a significant buy of 50 lakh shares by its main promoter group entity, SKIL Infrastructure Ltd. The deal was disclosed at National Stock Exchange after trading closed on Friday. Pipavav Defence stock had been on a serious fall since the first week of July, tumbling from Rs. 88 levels, with the fall accelerating during this week. The negative trend continued on Friday too, with this shipyard-turned-defence-player’s stock losing another 10.44% to close at Rs. 55.75 in NSE. Altogether, Pipavav Defence & Offshore Engineering Company has shed close to 37% of its value in July. StockExplain News had earlier reported on a massive buy of 2.15 crore Pipavav shares by India’s largest domestic institutional investor, Life Insurance Corporation of India, in early May. Post that deal, worth Rs. 171.21 crore, Pipavav Defence stock had rallied by around 11%. Friday’s fall was partly driven by a major institutional sell, of 67.69 lakh shares by the FII, SmallCap World Fund Inc, which is a unit of US based mutual funds major, American Funds, belonging to Capital Group. A few Indian mid-cap companies, including Pipavav Defence, have been experiencing panic-type selling during the last two days, which is said to be due to pledged shares by promoters getting dumped into the market by their financiers. This scenario is very much plausible in Pipavav, as its promoters who hold 43.34% stake in the company’s equity base, have pledged 97.29% of that stake with financiers, as per the latest Share Holding Pattern (SHP). In recent weeks, some promoter group entities had cut down on their pledges, but it seems to have been too little, too late. However, it is not confirmed whether the fall was actually caused by pledged shares of promoters getting offloaded in the open market, or an acute fear of such a scenario causing major long-type holders like SmallCap World Fund to exit abruptly. India’s stock market regulator, SEBI, has asked BSE & NSE to investigate the fall in midcap shares including Pipavav, and has also cut these stocks’ circuit limit to 5% from next week onward to control volatility. On Friday, Pipavav Defence management tried to allay the fears of investors that something was amiss with the company. The fact that the promoter group backed up such claims with some significant buying from open market on Friday may allay investor fears to an extent. The 50 lakh shares picked up by SKIL Infrastructure amounts to a 0.72% additional stake, and the total promoter group stake should now be 44.06%, even though much of it remains pledged. On Friday, promoters bought these shares at the rate of Rs. 58.69, making their latest investment worth Rs. 29.35 crore. Though such large promoter buys are definitely a positive cue for the stock, a couple of developments in the coming days may cancel it out. Firstly, the 0.72% buy by promoters was against an even larger 0.98% sell by the American Funds arm. As of Q1 end, this FII has been Pipavav’s third largest investor with a 4.89% stake. If SmallCap World Fund continues to sell similar quantities in the coming days, the stock may take a further hit. Also, there is a possibility of other large investors in the counter taking a similar view as this FII and trying to pare their stakes, if they haven’t already started doing so. Major investors in Pipavav Defence & Offshore Engineering Company are Life Insurance Corporation of India, IL&FS Maritime Infrastructure Company, Valiant Mauritius Partners, Export-Import Bank of India, IL&FS Financial Services, IDBI Bank, New York Life Investment Management India Fund, and Religare Finvest. Secondly, it is not yet known whether pledged shares of Pipavav promoters were indeed sold off in recent sessions. If such shares have been sold off by the lenders, then today’s buy by promoters may only be a small compensation for their reduced stake due to losing pledged shares. If there had been such transactions, the company, promoters, and financiers are expected to file mandatory disclosures with BSE & NSE within a stipulated number of days. On the fundamental side, Pipavav Defence is still a long way from turning around and delivering acceptable return ratios. Its FY’11 Return on Equity (RoE) was as low as 2.50% with FY’12 RoE expected to be even lower due to consolidated net profit halving from the previous year. However, the promise remains great due to the massive ship-building facilities it has built and the unique tie-ups it has managed to forge. Pipavav claims to have the largest dry dock in India and the second largest in the world. But more importantly, it had landed some key contracts with the Indian Navy. In 2011, Pipavav Defence had become the first private shipbuilder to get a contract to build 5 ships for the Navy, and it also became the first company to get a license to build warships for Indian Navy. Its bigger claim to fame is its more recent planned joint venture with the leading public sector defence unit, Mazagon Docks Ltd (MDL) to build surface war ships. MDL had selected Pipavav through a bidding process that both claim was fair enough, but which Pipavav’s competitors claim as unfair. Though there seemed to be some rethinking on Government’s part initially on this issue, later it supported MDL’s decision to go with Pipavav Defence. In the third week of July, the company had signed the Shareholders’ Agreement with MDL for creating this JV. Pipavav also has a technology tie-up with French naval manufacturing giant, DCNS. Rumours have also been floating around that DCNS and Government of Singapore may take significant stakes in Pipavav Defence at a reasonably high price. Despite the company’s ambitious plans, its prevailing poor return ratios coupled with the troubling share pledges made by its promoters have ensured that Pipavav Defence stock is a high volatility play. 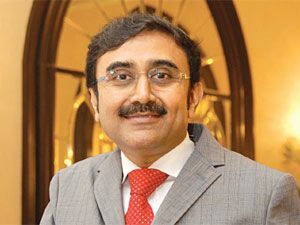 Founder and Chairman, Nikhil Gandhi, a self-made first generation entrepreneur, is known more for his sharp business acumen than for his company's corporate governance practices. On Friday, the stock came as low as Rs. 52.60, which is dangerously close to its 52 Week Low of Rs. 50.10, before closing at Rs. 55.75, which was still down by 10.44% from previous day’s close. If pledged promoter shares weren’t dumped in recent days, and if large investors like American Funds wouldn’t attempt follow-up sells, Friday’s share purchase by Pipavav promoters is likely to be taken as a positive cue by the market.